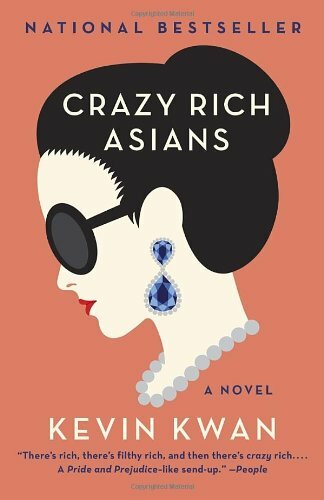 The award for truth in advertising goes to this book title, because Crazy Rich Asians by Kevin Kwan is about exactly what it claims to be: wildly wealthy Asian people and the competition, backstabbing, and debauchery that make up their privileged lives. And I must say, I enjoyed it quite a bit. It's dishy and fun reading about horrible people, people you'd never in a million years want to associate with in real life. It feels delightfully naughty to be a fly on the wall, listening in on the catty judgments of that dress she's wearing, that plane he just bought. The characters' lives are so far outside of my own lived experience, their actions so over the top and ridiculous, the book gave me the same eyebrow-raising enjoyment I used to get in my college days from watching soap operas. It was especially fun getting a peek into the upper crust of a culture I'm not too familiar with. I think we've all read plenty of books about bored, rich white people—they're a dime a dozen these days, and most don't offer anything we haven't already seen before. The ultra-rich Chinese, as depicted here anyway, are in some ways very similar to the WASP-y New Englanders I've encountered in fiction before, but in others are so, so different. Kwan's decision to give us an inside view of Singapore's elite through the eyes of Rachel, born in mainland China (which in itself is apparently a social faux pas) and raised modestly by a single mother in the US, provides some relief and much-needed perspective to the otherwise outrageous lifestyles portrayed in the book. An economics professor with a sweet, girl-next-door vibe, Rachel has no idea what she's getting into when she agrees to attend the wedding of her boyfriend Nick's childhood best friend. Nick has been pretty vague about the details of his upbringing, and their life together in New York is a far cry from what awaits them when they touch down in his home country—he's a much more eligible bachelor than Rachel ever realized. And you can just imagine everyone's reaction when they see how attached Nick has gotten to a no-name American with none of the connections or status they hold as all-important. Though at 400 pages it overstays its welcome a bit, Crazy Rich Asians is fun and gossipy, perfect for light and frothy holiday reading.